Charles ‘Chic’ Brodie was no doubt a perfectly serviceable goalkeeper in his day, we couldn’t possibly comment to the counter, but alas his 21-year professional career is generally boiled down to two memorable incidents. 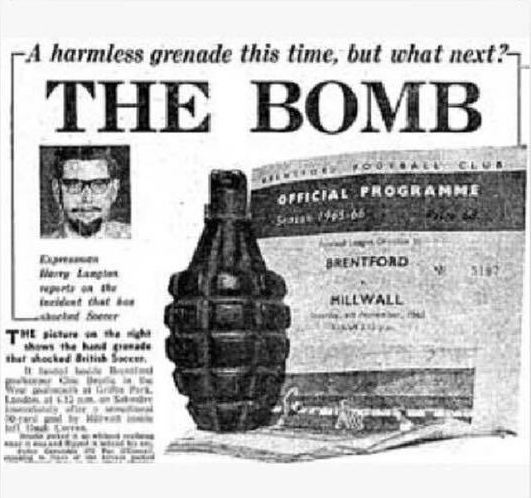 The first of which happened on November 6th, the day after Bonfire Night, back in 1965 during a match between Brodie’s Brentford and their cross-London rivals Millwall at Griffin Park. Brodie was diligently tending his goal when he heard an odd thud in the mud behind him. Lo and behold, a hand grenade had been tossed from the terraces and out onto the pitch. As the story goes, Brodie calmly picked the grenade up, inspected it and then casually chucked into the back of his net to be disposed of at a future juncture. Fortunately, the device was later analysed at a local police station and found to be a dummy. Millwall fans had essentially two big enemies, flash opposition goalkeepers and referees. At that time, Brentford had a bit of a fancy Dan goalkeeper called Charlie Brodie who delighted in winding up Lions fans. And so on the Friday before the game, it was decided to give up throwing coins, etc, at him and come up with something a bit more tasty. And so on the morning of the match, said hand grenade was loaded into the back of a Mini Cooper which then headed to West London. Yes the gang of four had triumphed beyond their wildest dreams. Five years later, Brodie would have his professional career prematurely ended by a dog-induced knee injury – thus bringing about his second notable entry into the great football pantheon. Look at that…the word SOCCER in a British news publication. I’ll keep this one in mind the next time I hear some insufferable purist’s tiresome “it’s FOOTBALL” diatribe. Chic was in goal for Margate when Bournemouth beat them 11-0 in the 1st Round of the FA Cup in 1971. Ted MacDougall scored nine of them.